On a sunny Monday morning in December, the line wrapped around to the side of the building, with more people arriving even as the time ticked down to the noon opening. The gathering crowd was ready for the doors to open into the new Salvation Army Service Center in Cleveland, Mississippi. Among those in attendance were representatives of the local chamber of commerce and Mayor Billy Nowell of Cleveland. 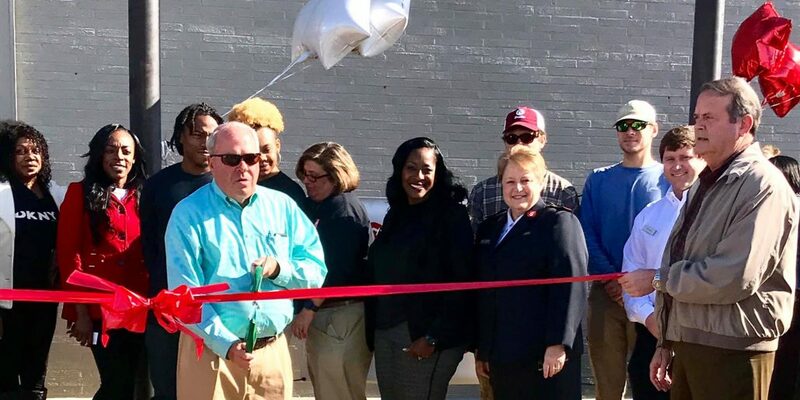 The line of people waiting to enter the store watched and applauded as Mayor Nowell cut the red ribbon, signaling the grand opening as the waiting crowd was finally allowed to enter. But this event opened the door to more than a thrift store.The Salvation Army Service Center provides services for a whole community. One of the first people in the door was Lillian Jones who said, “It’s going to be a very useful place to come.” Lillian and the small, pink sweater she bought for her grand-niece was part of a long line of people waiting to make her purchases at the thrift store. She was one of over a 130 people that day to make purchases for herself and her family. According to Bogan the event was “a very successful opening, one of the best grand openings we’ve had under my leadership.” The people in the store seemed to agree, as they were treated to refreshments and a first look at the thrift store that will serve their community. The Salvation Army’s Cleveland, MS Service Center will serve Bolivar, Coahoma, Humphreys, Quitman, Sunflower, and Washington Counties. Richard "Kirk" Daniel is the Media Relations Specialist for the ALM Division of The Salvation Army.